If you have just started your search for a junk car buyer or junk car removal service in St. Petersburg, Florida and have found our junk car buying company website —WELCOME! Cash for Junk Cars Clearwater FL is Pinellas County’s go to business when you want friendly, fair and easy junk car removal services. We begin with making it super easy for you to junk your car, junk an RV or to get cash for boats in St. Petersburg, Florida or anywhere in Tampa Bay! We’ve been providing honest, friendly and fast junk car removal services in Tampa Bay and we’re going strong! That’s because we back up our service with actions! No online forms to fill out, no collecting your information and no surprises or extra costs. JUST TEXT OR CALL to get an offer for your unwanted vehicle . If you accept our offer, we’ll come and remove it — FOR FREE. Telephone: It’s Easy! Text a photo of your junk vehicle or boat to: 727-776-6376 . Prefer to call? No Problem. We’re here to help. Once you text or call us, we will either text you back with a cash offer for your junk car or a request for more information. Remember, our offers include FREE TOWING of your unwanted vehicle in St. Petersburg, Florida. Why does this matter? 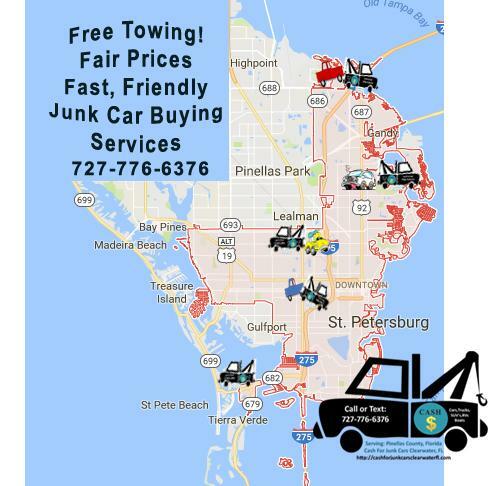 Many other St. Petersburg junk car buyers in Pinellas County, FL will offer you a cash price for unwanted vehicles, but they will then charge you for towing your vehicle– This often leaves customers with “out of pocket expenses” when they want to scrap their cars– That’s unacceptable and unfair. Whether you need to junk your car in St. Petersburg Florida, St. Petersburg Beach, Gulfport, Tyrone or in Kenwood, Cash for Junk Cars Clearwater FL is ready to serve you. We know that old, unwanted truck, car, RV or even boat can be stressful to deal with. Hanging on to a junk vehicle can be expensive and it can be an eyesore! If you want us to put cash in your pocket today and help you to get some peace of mind ( a clean yard, clean carport, space in garage, boat slip, etc!) simply call or text us for an offer. Junk your car with Cash for Junk Cars Clearwater FL and join our happy customers who junked their cars for cash!